As a technician, I am using my skills to improve the working conditions of my colleagues who are the ones providing assistance to the people in need. It is rewarding to know that I am helping the Congolese community in my own way. 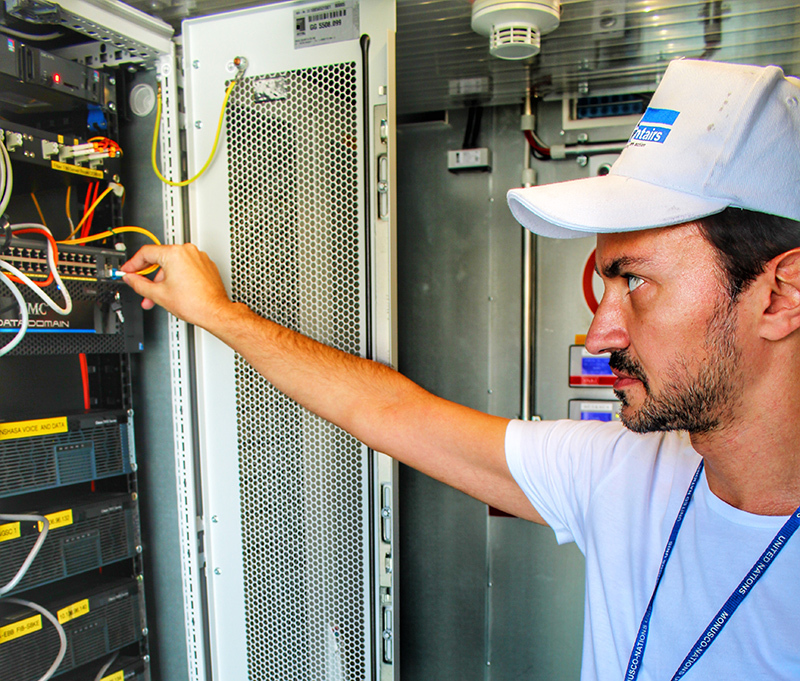 UN Volunteer David Bzhania making sure that the servers of the modular data center located in Goma, DRC are up and running. (Faivre, UNV, 2016). Goma, Democratic Republic of Congo . My name is David Bzhania and I work as a UN Volunteer network technician for the United Nations Organization Stabilization Mission in the Democratic Republic of Congo (MONUSCO). My main area of expertise is “networking” and I am responsible for planning and implementing new technologies for the mission. I implemented a service desk called “Ineed” in Goma (eastern DRC), which resolves in a simple and efficient manner the different Information and Communications Technologies issues that UN staff, UN Volunteers and uniformed personnel could encounter during their daily work. As a technician, I am using my skills to improve the working conditions of my colleagues who are the ones providing assistance to the people in need. It is rewarding to know that I am helping the Congolese community in my own way. I previously worked for the United Nations Observer Mission in Georgia (UNOMIG) but I really wanted to look at our world from a different perspective. When I was younger, I would have never imagined working as a UN Volunteer for one of the biggest UN peace keeping missions in the world and serve the community I am living with.